That account belongs to Jean-Lous (Jean-Louis Trintignant), a Catholic who drives around the Clermont-Ferrand area to attend Mass on Christmas Eve. Rohmer films the man's quotidian routine with long takes that nearly reminded me of the sometimes-excruciating shots in Antonioni films until I felt a warmth from them totally absent in the Italian's pictures. 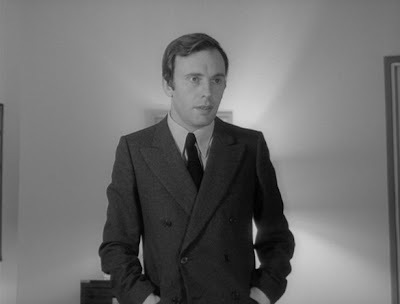 Rohmer doesn't hold his shots to stress any kind of disconnect or alienation; he merely gives one's realistic schedule its due. If anything, even less happens in this film than, say, Red Desert or L'Avventura, yet My Night at Maud's never lags despite its oscillation between these banal transitions and static, lengthy conversations. 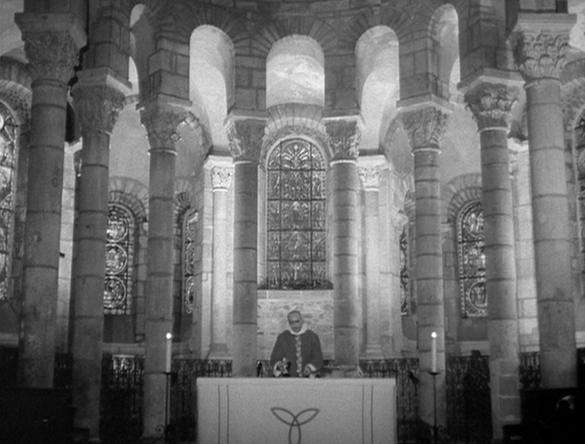 Just watch the way Rohmer's camera establishes Jean-Louis at Mass. Rohmer frames the priest in long shot, throwing the magnificence of the cathedral behind him and letting the surrounding drown out his words in its echo. The aesthetic distance prioritizes the material splendor over the words of the Mass, giving an insight into the nature of Jean-Louis' faith. But Jean-Louis does fancy himself a true Catholic, not the cynical Jansenist he sees in the writing of Blaise Pascal. Rohmer communicates this even before he shows the protagonist reading Pascal's Pensées in a shop: while still at Mass, Jean-Louis' attention drifts from the priest to a young blonde woman, Françoise (Marie-Christine Barrault) in attendance. The camera lingers on her as she listens to the sermon, the medium shot visualizing Jean-Louis' narrowed focus. Jean-Louis does not seek her out after Mass to speak with her, but he does not need to: he is in love, and he knows instantly he will marry her. Rohmer communicates all this without dialogue, though he soon enough addresses everything suggested visually via a series of probing conversations. Jean-Louis runs into his old friend Vidal (Antoine Vitez), a Marxist, and the two begin catching up via a philosophical discussion. Discussing his beliefs, Jean-Louis clarifies his aversion to Pascal's wager, finding his version of faith too cold. Ironically, the secular Marxist adheres to Pascal more than the Catholic; Vidal swaps religion for history and believes because he must. Even the non-believers must put their faith in something. Around this time, Godard was throwing himself into Maoism in the hopes of finding some sense to the world, but with the utmost graciousness and only the quietest irony, Rohmer gently points out that no one principle of belief can address all of life's complexities. All these ideas come to a head when Vidal invites Jean-Louis with him to the house of the titular Maud (Françoise Fabian), a divorcée for whom Vidal clearly has a thing. 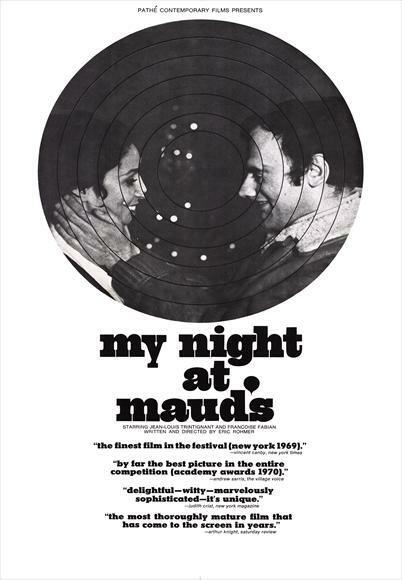 This sequence takes up a large portion of the film, dominated by a polite but combative testing of beliefs exchanged between Jean-Louis, Vidal, and the atheistic Maud. Fabian instantly changes the dynamic of the film, irresistibly seductive less for her gorgeous looks than the speed with which she registers Maud's piercing understanding of Jean-Louis and Vidal. A glint in her eyes early into the three-way debate reveals she has both men completely pegged, and her input, though less pompously phrased and delivered than the declarative statements of the other two, carries an edge of victory. Complicating matters is a snowstorm that strands Jean-Louis from returning home that night as a smiling Vidal leaves to go to his nearby home. The glee on Vidal's face as he leaves Jean-Louis with Maud is palpable, but why? Is he testing his friend's boasts of loving the mystery girl he saw at church above all others, proving the naïveté of Jean-Louis' obsessively pure behavior? I thought so at first, which made Maud's interpretation feel like a personal admonition. It's not about Jean-Louis at all, she argues, but her: Vidal is in love with Maud but knows she isn't interested, so he needs an excuse to hate her. This isn't the first character insight she's spoken aloud, but it is the most devastating. With a single line, she reveals a character's entire motive and decisively undercuts all his posturing. And the man's not even there! Jean-Louis, of course, is, and Maud takes her time peeling apart Jean-Louis' own pretenses. Wearing only a long nightshirt (and, later, nothing), she cannot help but chuckle when the man, who stays despite his polite protests, says that a man in love would never be tempted by another. She bluntly tears through his façade, telling him that all that matters to him is his respectability, which prevents any meaningful attachment as he's so focused on how he is perceived that human connection means less for its personal contact than for how it increases his spiritual standing. At one point, Maud asks Jean-Louis if he'd like to be a saint. He responds, "Not at all," but Rohmer has precisely arranged Trintignant in front of a lamp that throws an aura around him as he stands before the otherwise drab, gray wall. Though the camera faces Jean-Louis, the moment almost feels like a POV shot. Jean-Louis may deny his aspirations to holiness, but the director slyly reveals the man's image of himself. It's crucial to note that Maud's teasing and seduction of Jean-Louis is not meant to be cruel or even empowering in that tired way that an idiosyncratic female character often serves no other purpose than to spur a man's self-realization and development. Maud has her own complexities and wants, with her own sense of loneliness and lack of fulfillment that is distinct from the men's but no less real or recognizable. But neither is she enamored of Jean-Louis in the way he is of Françoise: her interest is just that, and it's up to Jean-Louis to do something about it. He nearly succumbs to the temptation, but pulls back at the last minute. The next morning, he seeks out Françoise and asks her out. There's an undeniable comedy in Jean-Louis' nervousness and his desperation to keep up appearances, but Rohmer also inserts flecks of sadness and hope into the character relationships. Whenever Jean-Louis is in Françoise's apartment, it's bathed in white light, glowing around the woman until the frame starts to suggest she's radioactive as much as angelic. He does not truly see her, only what she means to his image. Françoise even mutters a few faint protests at the speed with which Jean-Louis begins planning their lives together, but she finds herself going along with his love. Her acquiescence only further proves to Jean-Louis that their marriage is fated, even as he himself makes the conscious decision to avoid a relationship with Maud to "help" that predestination along. 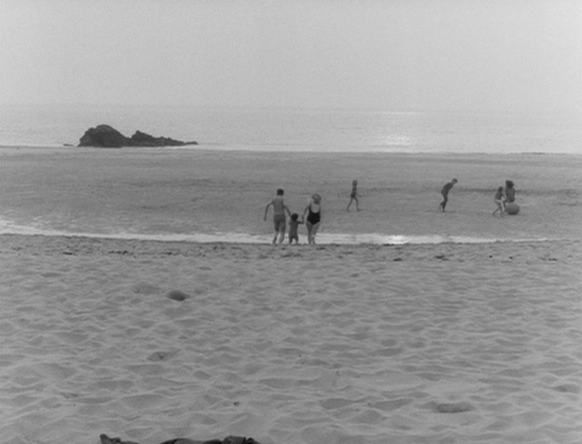 The film's coda, set a few years in the future on a beach, introduces a contrivance into the dynamic of Jean-Louis, Françoise, and Maud. It's somewhat out of place in a movie that otherwise feels so naturalistic, but the sudden understanding of how Françoise herself has a connection to Maud adds a literary twist of irony that reminds the audience this was all carefully arranged. But in a touchingly poetic final moment, Jean-Louis, Françoise, and their young child running into the water. It's simultaneously painful and exhilarating, as hope is wont to be, and it's hard to say whether Jean-Louis has at last embraced the present and forsaken his preoccupation with the propriety of things or if he's just running into the sea in an attempt to distance himself from reality. Given the multifaceted depth of Rohmer's writing, the truth likely incorporates both readings, and many others besides.